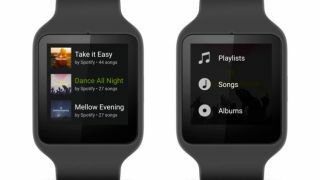 Soon you'll be able to better control your music from your wrist, as Spotify has confirmed it's coming to Android Wear but hasn't shown off any features just yet. So far we know you'll be able to choose tracks to play from your wrist, navigating through both your own music and the Browse section. We expect it won't come with search functionality - it'll likely work as a playlist browser. It's not currently clear whether it'll be a Premium members exclusive feature either. We hope those on free accounts will be allowed access, but there's no telling just yet. The app will begin rolling out in June and should be on all devices by the end of the month. Here's everything from Google IO 2015.